Years ago, Bob Moog donated to the theremin community a hand-drawn schematic he had created by closely examining Clara Rockmore's theremin. Since then, it's been the dream of many theremin enthusiasts that someone would be able to faithfully recreate her one-of-a-kind instrument. Well today we're one step closer! Adrian Bontenbal has been busy for the past several years in The Netherlands working on his own version of Clara Rockmore's theremin. He has shared with us a write-up including photos, schematics, and parts values for the components he had to substitute with modern parts. Unfortunately, we don't yet have audio samples of how it sounds, but if enough people show interest, perhaps we can sway him to provide a few. Here's to hoping it sounds as nice as it looks! Read Mr. Bontenbal's write-up for more details on this ambitious project. Update - March 4, 2012 - Mr. Bontenbal has provided an updated write-up that includes some information omitted from his previous article. Update - June 24, 2012 - Another update with an additional timbre control circuit added, allowing the player to choose between normal theremin, brass, or flute-like tones. 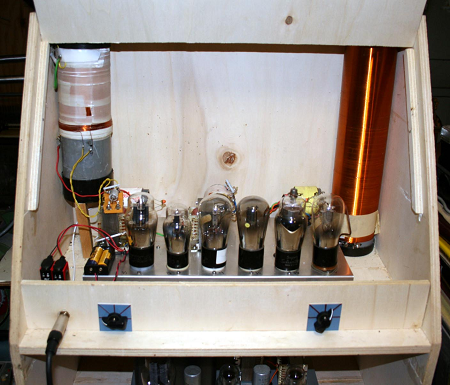 Also includes a new circuit that lights an LED when a reference tone of 440Hz (A) is played.